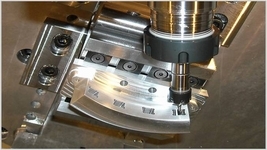 The manufacture of parts with detail-oriented precision can be accomplished with 3-axis, 5-axis and 6-axis CNC lathes. The full-service vendor uses machinery with conventional fixed headstock and Swiss-style CNC lathes that perform complex operations such as cross drilling and cross tapping, cross milling and slotting, C-axis milling and off-center work. Most of the parts made using CNC precision methods are complete and do not require secondary and off-line operations. Each step in the component-making operation is precisely located and oriented by computer controls. The use of live tools on CNC lathes allows manufacture of complete and complex parts in one operation thereby eliminating handling errors. Automatic bar loaders increase productivity. Parts are produced from bar stock up to 1-3/8" diameter in a variety of materials, ferrous and nonferrous. Advantages include the economical production of complex parts in medium to higher lot sizes. C-axis milling produces even the most complex shapes - complete in one operation. High process capabilities results in superior surface finishes and minimal dimensional variations, even on the most difficult materials. Engineering expertise, experience, state-of-the-art equipment and in-depth knowledge of process materials provide a solid basis for supplying hydraulic, pneumatic, electronic, office, agricultural, medical and aerospace equipment. All of the operations in precision machining must be supported by an effective quality control program. Important elements of quality programs include the integration of statistical process controls, machine capability studies, a computer-aided coordinate measuring system, incoming inspection routines and traceability of materials requirements.